Nature inspired robots are becoming more sophisticated than ever before. But keeping the design simple and lightweight still remains one of the biggest challenges. 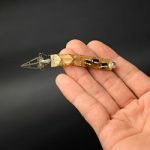 Arthrobots, developed by a team of researchers from Whitesides Research Group at Harvard University, are semi-soft, lightweight robots built using polypropylene tubings (drinking straws) with relatively simple structural construction. 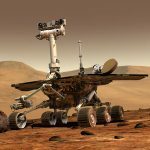 Why are they called “arthrobots”? 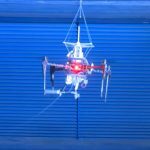 Researchers explain that it is because the robots “use a mechanism of actuation that is inspired, in part, by the joints of spiders, [but] use gaits that resemble those used by different insects.” The researchers decided to take direct inspiration from the musculoskeletal system of arachnids or spiders. Even though spiders have complex leg structure, the mechanism of extension in the legs of spiders is considered simplest among other arthropod groups. The leg joint of a spider is comprised of a flexible hinge that allows motion of rigid exoskeleton, a resting state (i.e. folded joint), a hydraulic mechanism for joint extension, and an integrated muscle-flexor. Similarly, Arthrobot joints are made up of the following structural parts: 1) notched flexible hinges built using thin polypropylene straws; 2) an inflatable elastomeric balloon (i.e. actuator) inserted into the notched tube; 3) an elastomeric band attached inside the joint to provide an elastic restoring force. For a simple construction, a wide polypropylene straw (or Bubble Tea straw) with outer diameter of 1 cm is used. 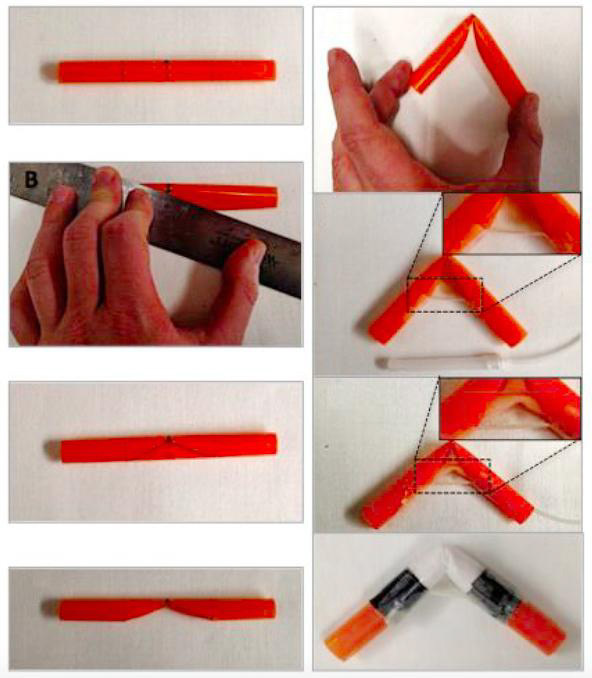 After marking and notching out the center of the straw (Figure 1), a rubber is taped inside of the joint to form a tendon. Then, a elastomeric tubing 5 cm in length is inserted into the straw. For added structural support, the joint was “sleeved” before attaching tendon by wrapping around a single layer of non-woven sheet. 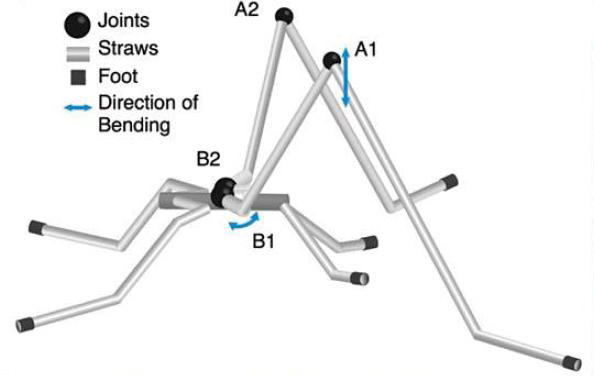 Eight-legged arthrobot, in particular, features additional folded tube inside the joint before adding the sleeve, as well as a second set of elastomeric tendons. 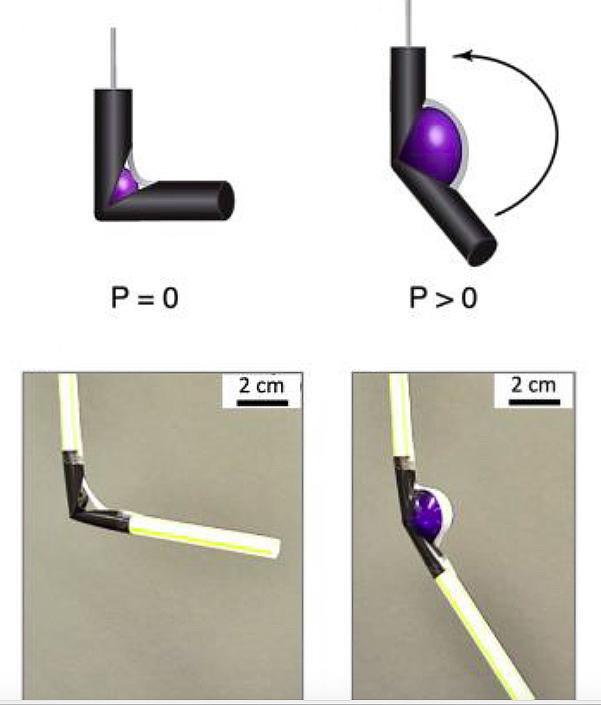 This spider-like robot measures 60 cm long and weighs 150 g. Each leg also has 2 DOF, similar to the six-legged arthrobot. It follows the same motion sequence as described above: move leg off the ground, then forward, down back to the ground, and move backward. The construction and locomotion of this robot is different, however. 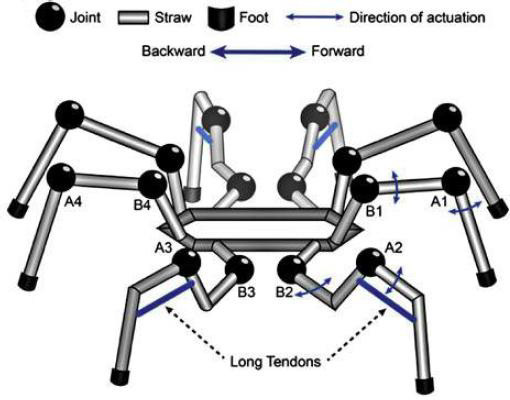 There are symmetric two pairs of front and rear legs that each contains a pairs of joints bending in the same direction relative to the ground (e.g. Figure 4; A1 and B1). These joints enable the robot to pull the body forward using the front leg tendons and push the body forward using the back legs. In addition, there are two symmetric pairs of side legs that each contains a pair of joints with a relative orientation of 90 ̊ (e.g. Figure 4; A2 and B2). The joints situationed on the inner side (B2) enable forward and backward motion, whereas the joints on the outer side (A2) allow moving the leg off the ground and bringing it back down. 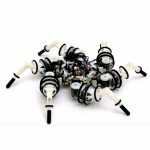 The eight-legged walking arthrobot implements a gait that actuates each limb individually into the forward position, then move all the limbs back simultaneously. 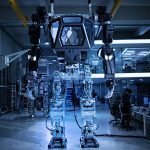 The 16 joints of the arthrobot are sleeve-reinforced, which means additional tubes were attached inside the joint, to facilitate precise timing of actuation and sufficient pressure to support the weight of the robot. A second set of tendons were attached to the middle pair of legs for additional retracting force. 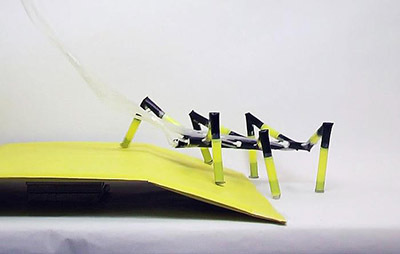 Unlike previous robots, this arthrobot uses buoyancy to float. 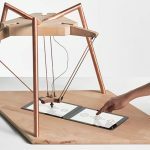 Measuring 50 cm across and weighing 25 g, rowing arthrobot implements a two-limbed rowing motion to glide across the water surface. The ends of each leg are sealed and a thin layer of hydrophobic silicon grease was applied to each foot for increased hydrophobicity. The sequence of motion replicates that of water striders. The middle pair of limbs primarily performs a rowing motion while the front and back legs act as static support to provide buoyancy and stabilization on the water surface. In its initial resting position, the joints are unpressurized and the limbs are in front in contact with the water surface. B1 and B2 joints are pressurized to move both limbs backward and push the body forwards. Then, A1 and A2 joints are pressurized to live the two limbs while B1 and B2 joints remain pressurized. All joints are unpressurized and return back to the passive, resting (forward) position. The joints (B1 and B2) are also sleeved to prevent over inflation of the balloons and to enable sufficient pressure for progressive movement of the legs.